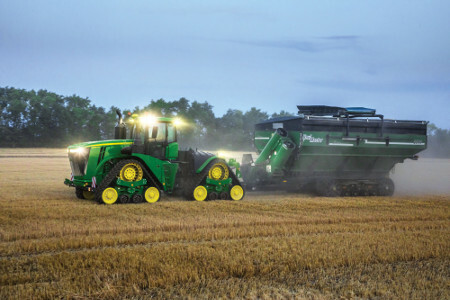 John Deere 9R, 9RT and 9RX Series: The Ultimate Power. 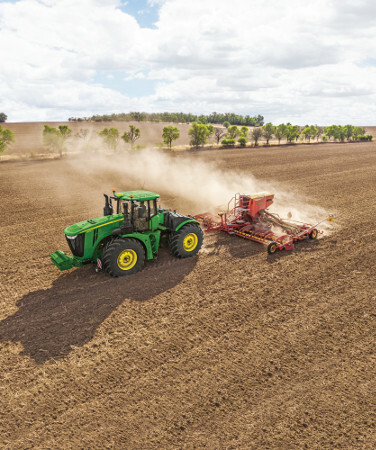 The John Deere 9RT Series tractors give you a horsepower increase of 50 hp (37 kW) across the range of models, all the way up to 627 hp (461 kW). 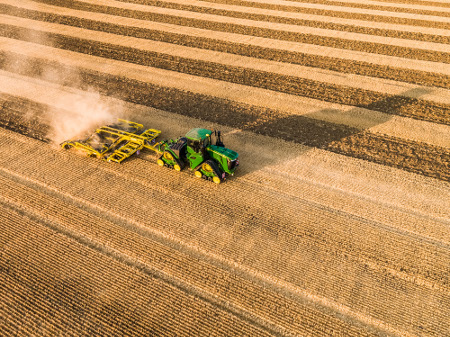 9RT tractors are designed to tackle the toughest challenges in contemporary agriculture: improving your productivity, reducing costs and mitigating risks. Turning just one axle, the 9RT puts most power to the ground and delivers excellent straight-line pulling. With a 0-degree turning radius, it is also highly manoeuvrable. The 9RT offers the ideal compromise between compactness and high ground contact area. 9RT Tractors feature speed-sensitive steering to improve performance and durability across a wide range of applications. The steering control unit adjusts the steering rate according to the vehicle’s ground speed, while the steering sensitivity can be adjusted by the operator. All 9RT Tractors are fitted with a 130-cc (7.9-cu in.) heavy-duty steering pump for solid steering performance in tough working conditions. 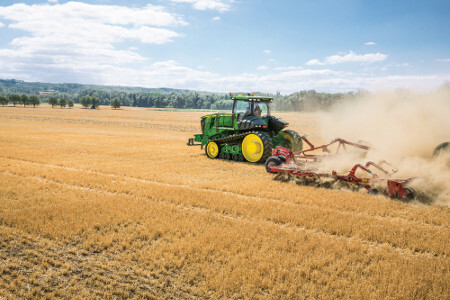 A five-pinion outboard planetary drive set and stronger axle housing improve handling for the increased horsepower used in deep tillage applications. The lubrication system features pressurised, cooled, and filtered oil for greater component reliability and service life. Axle bearings are internally lubricated, eliminating the need for external grease fittings. 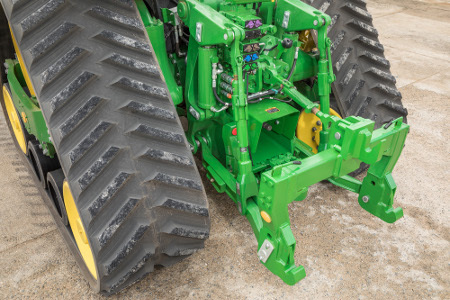 9RT Tractors use a 1,524-mm (5-ft) friction drive wheel to provide a high-contact area (with more than 180 degrees of wrap), minimising belt-to-drive wheel slippage. A track tension cylinder ensures friction between the drive wheel and the track, allowing you to put more power to the ground. 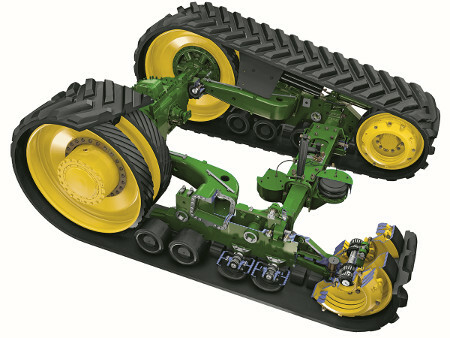 9RT Tractors feature industry-leading track tension for unsurpassed contact between the drive wheel and belt. The front idler wheel is mounted on a pivoting link that is attached to the front of the track frame. All 9RT Tractors are equipped with the exclusive AirCushion suspension system. It isolates the entire front chassis from harsh inputs due to uneven terrain and allows each track to operate independently for maximum ground contact. The system also allows the vehicle to travel much faster over rough terrain while providing increased operator comfort. The 9RT Tractor’s base weight alone will be adequate for putting power to the ground for nearly all applications. Additional ballast is, however, likely to be necessary to obtain the optimum weight split of 60 percent front and 40 percent rear. Proper weight split ensures maximum in-field performance by maintaining ground contact over the entire length of the track belt as well as optimising ride quality. Mid-rollers are strategically spaced to prevent vibration and to keep the mid-rollers from being vertically aligned with a traction lug at the same time. The two-piece mid-roller design also reduces costs when replacing worn components. Heavy-duty polyurethane mid-rollers, available as a factory-installed option, generate less heat under high loads and last longer than rubber-coated mid-rollers. They are specifically designed for applications requiring frequent transport at higher speeds and with heavy loads, and are highly resistant to rock chipping. 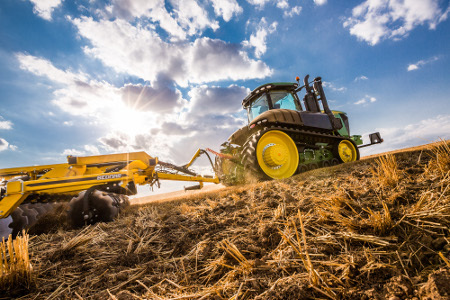 John Deere offers the Camso® Durabuilt® 4500 and 6500 Series rubber track options exclusively in 762-mm (30-in.) and 914-mm (36-in.) widths. The Durabuilt 6500 Series track is the most durable for 9RT Tractors. It provides improved rubber and more woven steel threads for extended tread and guide-lug life in severe applications. Camso is a trademark of Artic Investments S.A. Durabuilt is a trademark of Camso, Inc.
John Deere 9R Series Tractors deliver high levels of performance through efficient, reliable, and powerful engines. 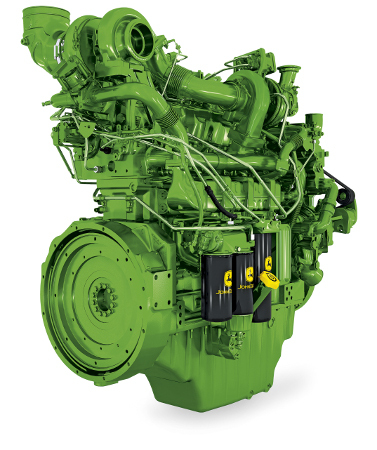 The models from 350.5 kW (470 rated hp) up to 387.8 kW (520 rated hp) feature the proven PowerTech™ PSS 13.5L engine. These air-to-air aspirated engines deliver constant power over a wide range of engine rpm with a 38 percent torque rise and 10 percent power bulge above rated power. All other models feature the Stage IV Cummins® QSX15 15.0-L inline engine. It incorporates the Cummins extreme pressure injection (XPI) fuel system, delivering cleaner combustion and improved engine response while meeting the latest emission regulations. Combined with Cummins variable geometry turbocharger (VGT), this fuel system provides optimal performance with a precise match of engine rpm and load demands. Diesel exhaust fluid mixes with engine exhaust gases in the catalyst to reduce further nitrogen oxides (NOx). The industry-leading diesel exhaust fluid (DEF) consumption is just 2 to 3 percent of diesel use. 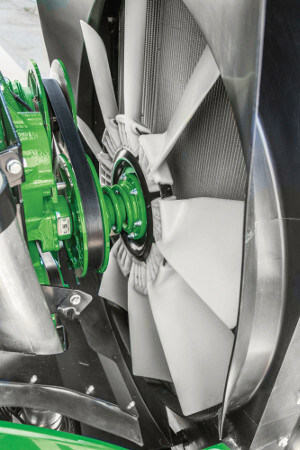 The belt drive used in the Vari-Cool system transfers almost 100 percent of the power from the engine to the fan. The variable fan speed sheave is electronically controlled, only operating at the necessary speed to cool the engine and other auxiliary components. The 13.5L PowerTech PSS engine utilises two turbochargers and the 15.0-L Cummins QSX engine has a VGT. Both options offer excellent power density, torque, and transient response. They also deliver more air to the engine, keeping it running efficiently and pushing your performance further. We have a long-standing relationship with Cummins and already use their engines in many John Deere tractors. Our technicians are trained to service Cummins engines, so you can get all the support you need from your John Deere dealer. Exclusively designed for all tractors in the 9 Family, the e18 PowerShift™ transmission delivers maximum fuel economy and productivity. The e18, an 18-speed full PowerShift transmission, provides 18 forward gears in total, including 10 gears in the 4.8- to 12.9-km/h (3- to 8-mph) main working range. 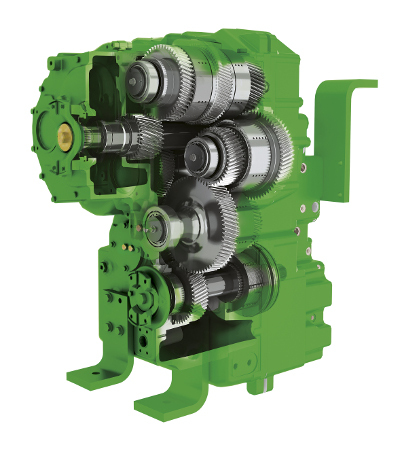 This robust, John Deere-designed transmission system allows you to select the right gear for the operation to obtain maximum fuel economy and productivity. The e18 transmission with enhanced Efficiency Manager™ feature is standard equipment on all tractors in the 9R/9RT/9RX Family. It can shift gears automatically to maintain engine ground speed, relieving the operator from shifting during significant load changes for a stress-free ride. The operator just sets the maximum speed and the transmission will shift, depending on the load, to reach the set speed at minimum engine rpm for minimum fuel consumption. *NOTE: 9R with group 48 tyres at 2,100 rpm. If the operator wants full manual control, the automatic PowerShift feature can be shut off by depressing a touch pad on the CommandCenter™ display or manually shifting the transmission with the shift control lever on the CommandARM™ controls. With Efficiency Manager, you can set two different ground speeds. F1 can be set at any speed between 3.2 and 20.3 km/h (2 and 12.6 mph). F2 can be set at any speed between 3.2 and 40* km/h (2 and 24.9 mph). You can change between the two with the flip of a switch on the CommandARM controls. *NOTE: Depending on model and country regulations. The CommandView™ III cab is one of the quietest and most comfortable on the market. And it's fitted to meet your every need during the working day. When you climb into the CommandView III cab, the first thing you notice is the space you have and the premium fit and finish quality. Thanks to the laminated glass and front sound barrier, you will enjoy minimal noise intrusion. 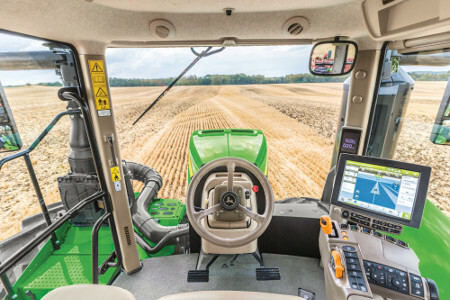 The 360-degree antiglare windows, a streamlined bonnet, and an improved cooling system to reduce heat haze combine to give an unparalleled view of the field all day, every day. We like to look after you when you’re working long hours. 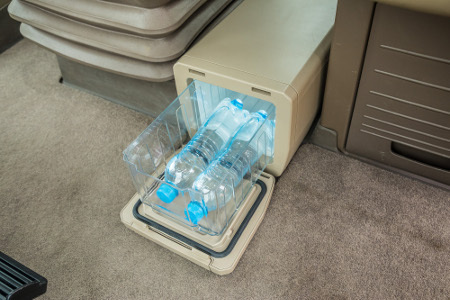 That’s why the onboard refrigerator and storage space lets you pack enough to keep you going all day. 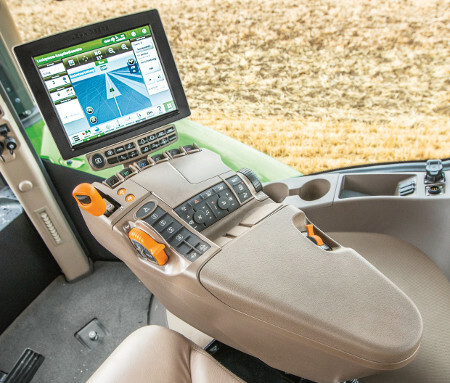 With the CommandCenter™ display built into the tractor’s CommandARM™ console, you are perfectly positioned to control every function at the touch of a finger. Navigation is made easy with logical menus and a comprehensive shortcut bar. Using the quickline function, you can now record an AB line with just one button press. Brightness can be lowered for better comfort and performance at night. Select the 17.8-cm (7-in.) 4100 CommandCenter display with CommandCenter AutoTrac™ activation, or choose the 25.4-cm (10-in.) 4600 CommandCenter display, which also allows you to upgrade to the CommandCenter Premium activation and now includes Section Control and basic documentation capabilities. The Generation 4 CommandCenter is AEF ISOBUS compliant. You can control your ISOBUS-ready implement through Universal Terminal (UT) and run automatic section control through Task Controller (TC-SC, TC-BAS), depending on the AEF certification level of the implement. The CommandCenter functions just like a tablet with touchscreens: navigating through the options is simplified via menus, shortcuts, and with context-sensitive help. And you can run our field-proven mainstream Ag Management Solutions (AMS) features. 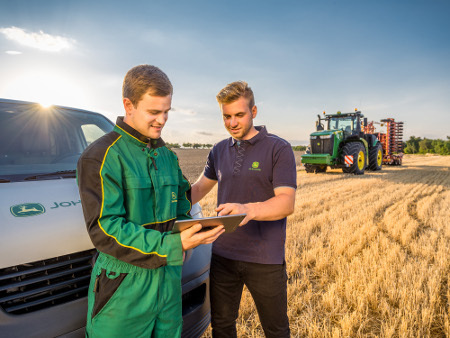 John Deere technology is intuitive even for beginners, making it easier to push your performance further, whether it’s optimising transmission speed, adjusting selective control valves (SCVs), or setting guidance lines. The Settings Manager allows you to reduce the set-up time for all your applications, such as engine SCVs and the rear hitch, as well as configuration settings for the electronic joystick. This allows you to instantly recall settings for implements and operators. 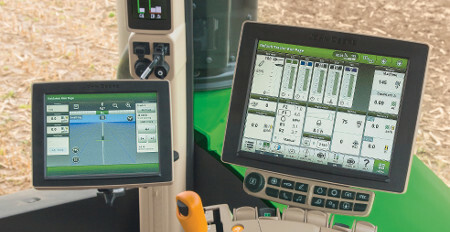 The 4600 CommandCenter display is connected to the Operations Center on MyJohnDeere.com through Wireless Data Transfer (WDT). You can conveniently send set-up files from the office to the field and send applied maps and totals from the field to the office. 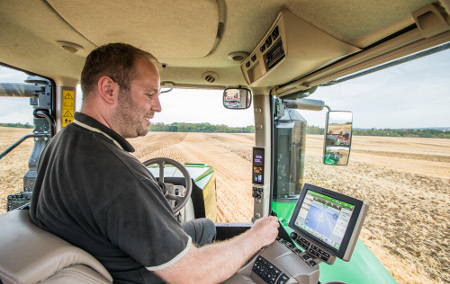 By adding the Extended Monitor to your tractor, you can easily move functionalities from one monitor to the other in order to maximise productivity by monitoring all your applications at once (e.g., vehicle control on your primary display and Precision Ag applications on the Extended Monitor). ACS reduces steering effort at the headland and gives superior handling capabilities during transport speeds. ACS is a factory option on all 9R and 9RX Series Tractors. 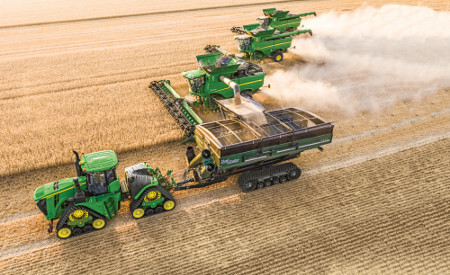 With ACS, John Deere has designed one of the most robust and fully encompassing steering systems in the industry. Whether in the field or on the road, ACS reduces steering effort, which can result in reduced operator fatigue and can improve operator comfort. The ACS system is fail-operational, which means steering is still functional in the event of any single-point failure. Variable ratio steering provides light, agile steering at slower speeds and heavier steering for higher speeds. ACS automatically reduces to 3.5 lock-to-lock steering wheel turns for quick headland turns and lowers hand-wheel motion by 75 percent. 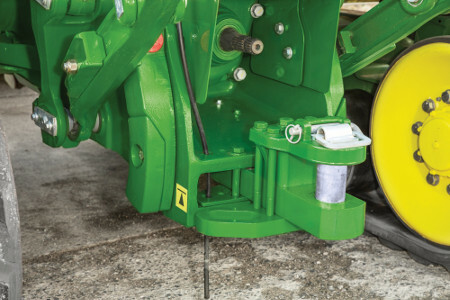 This feature keeps your tractor on track with minimum effort. 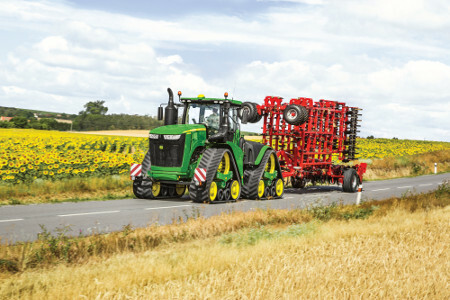 Dynamic road wheel offset control automatically adjusts the road wheel angle based on the lateral acceleration of the tractor. Steering wheel resistance automatically changes with ground speed to deliver light steering effort at slower speeds for less effort during headland turns, and higher steering wheel torque at transport speeds for better comfort and line holding. 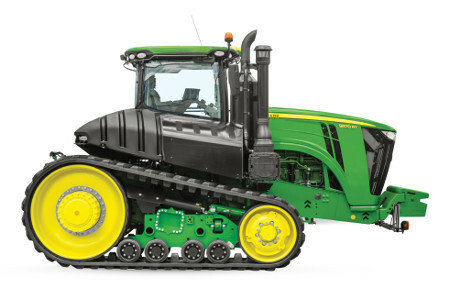 The sloped composite fuel tank design gives all 9 Series Tractors a sleeker look and allows for filling on both sides. 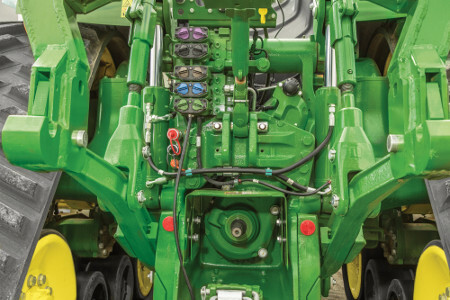 The 9R Tractor fuel tank is located over the rear axle and features a dual-fill design, which allows the machine to be filled from either side of the fuel tank. The diesel exhaust fluid (DEF) tank is located on the left-hand side of the tractor. It can be filled from ground level and has a protective shield to keep debris out of the fill neck. The 9RT Tractor fuel tank is located on the left-hand main platform. 9RT Tractors all feature a DEF tank with the fill location near the diesel fill location. 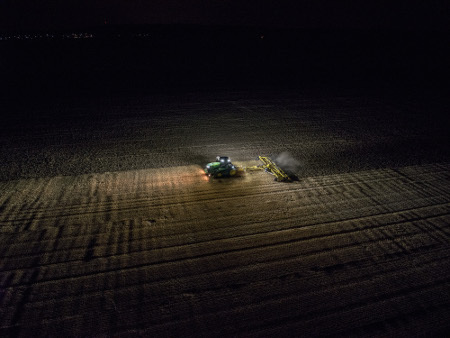 Operators can see more, concentrate better, and work longer with the dazzling lighting system on all tractors in the John Deere 9 Family. The cab lighting pattern and hood lighting provides 360-degree coverage for completely programmable, stadium-style lighting. This ensures there are no dead zones or lighting adjustments needed. The 24 light-emitting diode (LED) lights deliver 40 percent greater coverage width and 10 percent more rear light coverage, yet they use 45 percent fewer amps than standard halogen lights. The result is that night becomes like day, putting less strain on the eye. LEDs are virtually indestructible, with a minimum 10,000-hour life expectancy and high resistance to vibration and extreme temperature. CommandCenter™ display controls allow operators to customise light settings. Operators can select only the lights they need or want for a given application and store these settings. The operator-programmed configurations can then be turned on or off with the push of a button on the CommandARM™ console. Up to 24 lights provide 360-degree visibility, with working lights wisely integrated into the front, rear, and sides of the roofline to prevent possible damage from over-hanging branches. 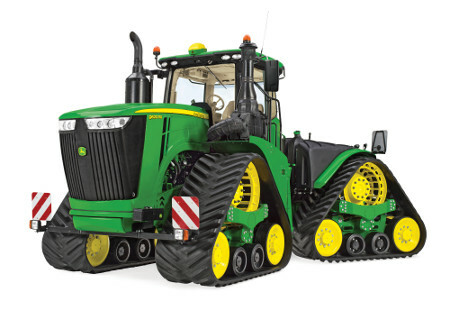 9R, 9RT and 9RX Tractors feature standard and premium lighting package options. The high-capacity alternator provides plenty of power to handle the increasing electrical loads of today’s auxiliary functions and implements. A 200-amp alternator is supplied as standard on all models and is powered by an auxiliary drive from the transmission input shaft. An optional higher-capacity, 240-amp alternator provides more readily available power to the tractor, implements, and monitors. 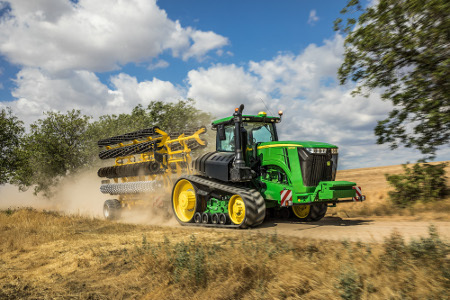 Tractors in the John Deere 9 Family offer a wide range of hitch, PTO, and drawbar options, combining incredible pulling power with versatility across a huge variety of applications. Both rear hitch options are available with a hitch lift capacity of either 6.9 tonnes or 9.0 tonnes, especially for heavy, fully mounted implements. Many implements require Category 5 drawbars to maximise their potential while increasing reliability. The John Deere Category 5 drawbar features a 70-mm (2.75-in.) drawbar pin, a 35 percent larger bottom support on the drawbar clevis, and up to 5,443-kg (12,000-lb) vertical load carrying capacity. 9RT models are optionally built with a Category 5 drawbar with wide-swing drawbar support. 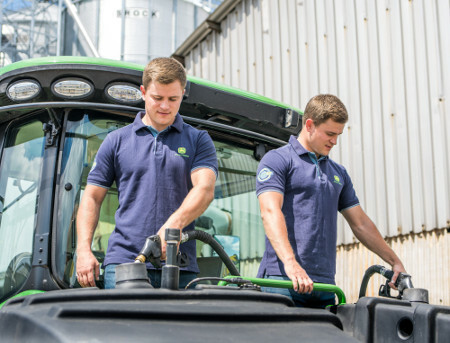 All tractors in the 9 Family utilise an electro-hydraulic PTO-engagement switch to activate the optional 1,000 rpm PTO with 45-mm (1.8-in.) diameter shaft. This allows you to run the equipment longer per season, such as operating large grain trailers during the harvest season. There’s plenty of power to go around with the closed-centre, pressure-and-flow-compensated hydraulic system with a capacity all the way up to a breathtaking 435 L/min (115 gpm) at reduced rpm to save fuel. 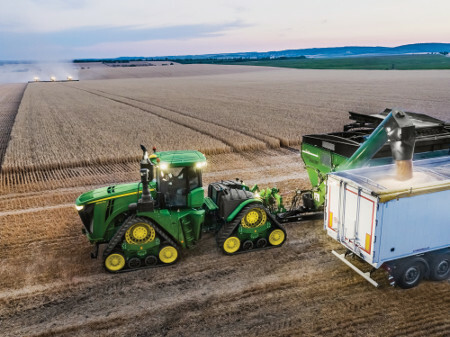 John Deere’s advanced hydraulic technology helps reduce the load on the engine and improves fuel efficiency, which in turn reduces costs and boosts productivity. The selective control valves (SCVs) provide excellent adjustability of hydraulic flow, enabling you to adjust flow rates minutely, whatever the application. 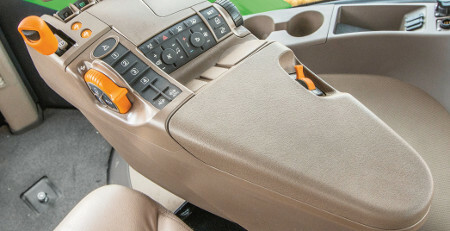 Best of all, you can control all hydraulic settings from the comfort of your cab. 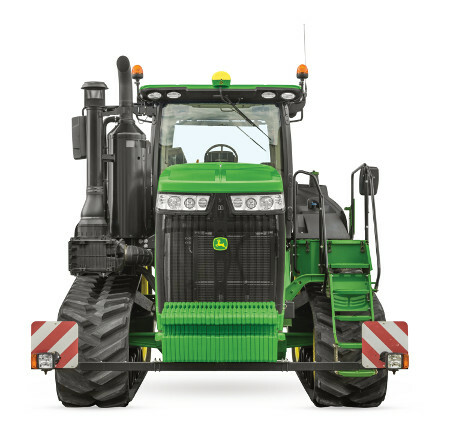 Tractors in the 9 Family can be equipped with up to eight electro-hydraulic SCVs that can be controlled through the CommandCenter display. Each SCV has its own controller, making field installation of additional SCVs easier. Power beyond auxiliary hydraulic connections provide live hydraulic power to equipment. 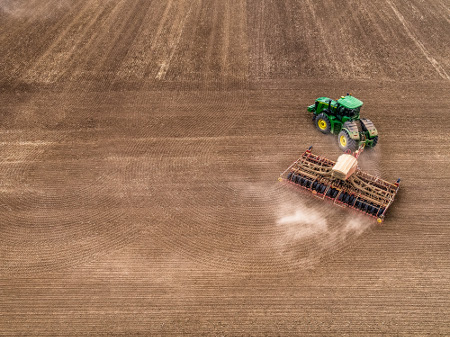 This enables the supply of hydraulic oil to implements with their own control valves or hydraulic motors (for example, on large air seeders or on planters). The system includes one motor return coupler, one flat-face sump coupler, one power beyond pressure coupler, and one load sense coupler. In certain situations, such as running fan motors with air seeders and planters, the hydraulic power requirements of the pump reduce the lugging capacity of the tractor. They are programmed to allow an additional 18.6 kW (25 hp), up to the maximum tractor model horsepower. AutoTrac hands-free steering adds more comfort; it reliably steers your tractor from day to night, through dust or on hilly terrain. This prevents costly overlaps or gaps and enables every operator to run at peak performance. With the Generation 4 CommandCenter™ display and a StarFire™ receiver, all you need is a CommandCenter AutoTrac activation and you’re ready to start. Using AutoTrac, you can expect up to 8 percent* input savings and up to 14 percent** productivity increase. Take the next step in precision productivity with iTEC™ Pro control enhancing AutoTrac with automated headland turns. 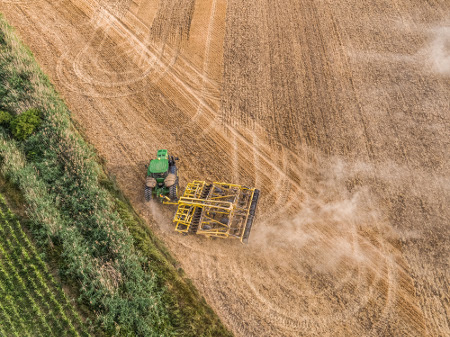 Spray, spread, and seed with perfection even on wedged-shaped fields using John Deere Section Control. 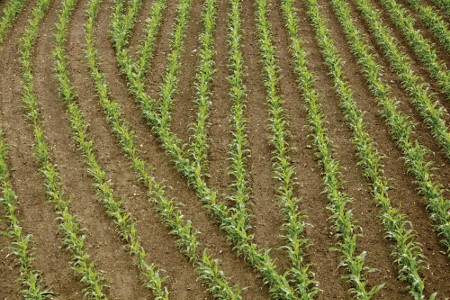 Enjoy picture-perfect headlands with consistent crop growth and reduced soil compaction. iTEC Pro fully automates headland turns, taking over steering and tractor controls so you can stay relaxed. 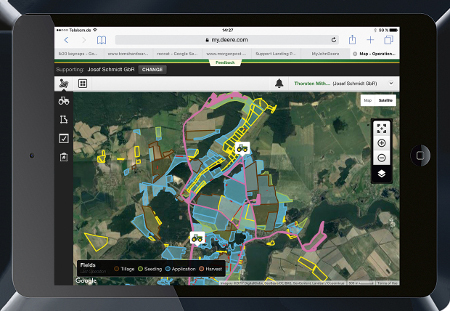 John Deere Section Control minimises skips and overlaps automatically on-the-go. As a result, you can do a better job faster and save money on fertiliser, chemicals, and seed. You’re managing a complex enterprise. That’s why optimising the overall business depends on being well connected to your ongoing operations. The Operations Center on our Ag web portal MyJohnDeere.com makes it simple. It connects you to your machines, your operators, and your fields from one central location. It also allows you to exchange information seamlessly with your John Deere dealer, your contractor, or other trusted partners. JDLink Access plus Remote Display Access (RDA) shows you where your machines are, what they’re doing, and how they perform. You or your dealer can remotely assist your operators with machine setup and operation leveraging RDA. Eliminate paperwork and endless phone calls during job planning, execution, and reporting. With the MyJobConnect™ app, you can assign clearly defined tasks to your operators on-the-go, utilising the MyJobsManager app. 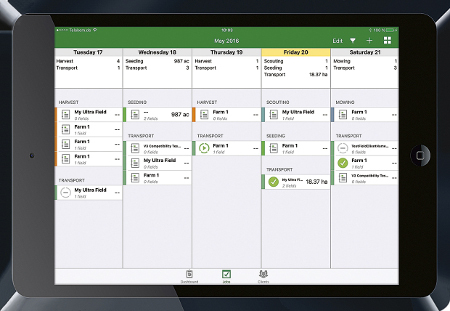 Your operators can view the work orders in real-time and execute accordingly utilising the MyJobs™ app on their mobile device. And once the job is done, you have instantly accurate and complete data at hand for quicker job reporting and professional invoicing. Go to the Operations Center to allocate exact field locations for the next jobs, track the work progress of your machines, easily assign work orders to your operators, view as-applied maps automatically sent from the field as well as create, analyse, and share application reports with trusted partners and customers.